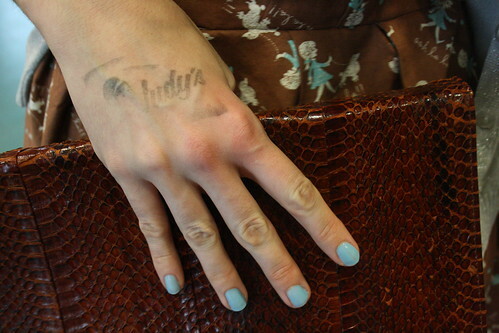 t*rexes and tiaras: tired clothes and vintage eyes search for the stars..
tired clothes and vintage eyes search for the stars..
so a week ago, alex and i headed to aintree racecourse to check out judy's affordable vintage fair..i was rather excited as i had heard good things of these events, but have never been close enough to one of the venues at the right time to check it out.. i didn't really get any pictures of the event, mainly down to the fact that i forgot to take my camera last weekend at all..but alex's photography skills are better than mine anyway, so check her post here about it..
dress: handmade by me // boots: irregular choice // cardigan: h&m // clutch bag: vintage, borrowed from alex// nail polish: no7 minty fresh (i have been using so many vouchers recently, my nail polish collection is ever-growing! i would definitely recommend one of these events if they come to you..i did make some purchases, which i will show in the next few posts..
Argh I keep missing these fairs when they're in Sheffield. I've definitely been missing out. I have a sneaking suspicion that they will be cheaper than our charity shops around here, too! I love your dress! Do you make them for other people? If not, you should- you're very talented! 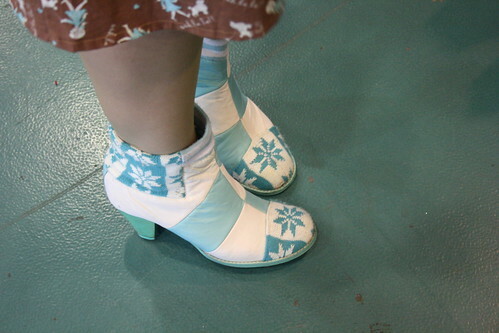 I've fallen in love with those heavenly boots. That eau de nil colour is probably my favourite colour. Actually, I rather love the whole outfit-you're damned nifty with a needle, aren't you? Good clutch bag, ha ha! (Need I say more?) It's great to see it being used. I've never been to one of those fairs but it looks as tho' it'd be a jolly good way to spend a day! 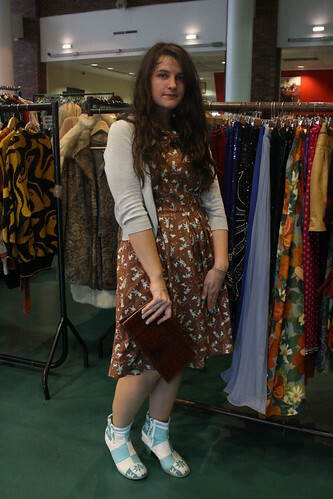 Hope you had fun at the vintage fair! The print on your dress is immensely adoreable btw. 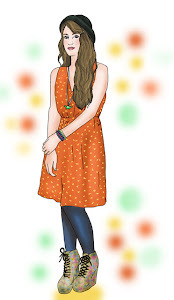 You have awesome dressmaking skills - it looks great on you. (I'd have nicked Alex's clutch too, very nice). I love your boots! 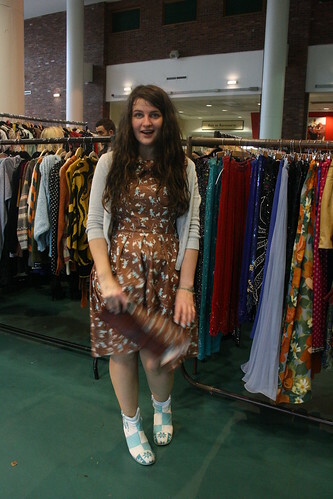 I went to one of the affordable vintage fairs in Southampton a few months ago, it was really good and I'd definitely go to another one. Looking forward to seeing what you bought! The print on your dress is amazing! 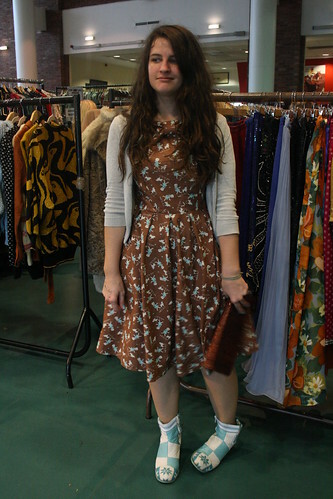 love your shoes co-ordinating with that fab dress you made! Your style is so unique, it's refreshing. 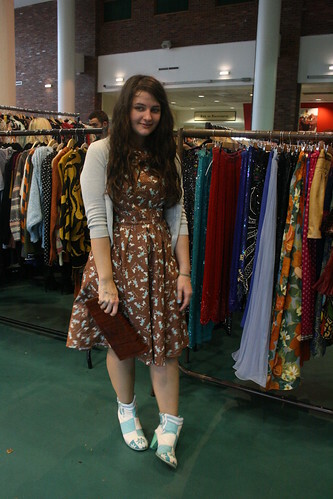 Vintage fairs are the best, you can always find something pretty! There isn't much of that kind of thing over here in Northern Ireland, but I must admit, they are always good when there are! I'm amazed at the dress you made, it is magnificent. 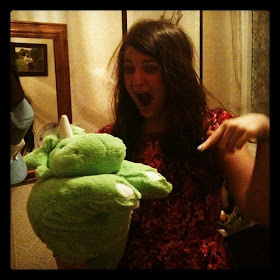 You made it all by yourself and it's environmentally friendly! I'm looking forward to the following posts of what your purchased!